It is recommended to download first the PDF Document DDDAC1.pdf with the schematics. 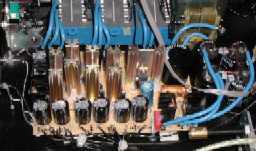 The power supply unit is providing separated regulated supply voltages for the digital sections (5Volt plus and minus), the analog sections (plus and minus 5 Volt separated for left and right channels) and the tube stage supply voltage and filament supplies. All overdesigned to keep noise low and to keep the regulating part as much as possible out of the signal path. It looks more complex than it actually is. It is just repeating a standard LM317 regulated design for every Voltage needed. The little capacitors around the bridges are helping to keep line noise away from the regulator, big Elco's are used to keep internal impedance low and parallel MKP's are used to compensate for high frequency losses in the Elco's. 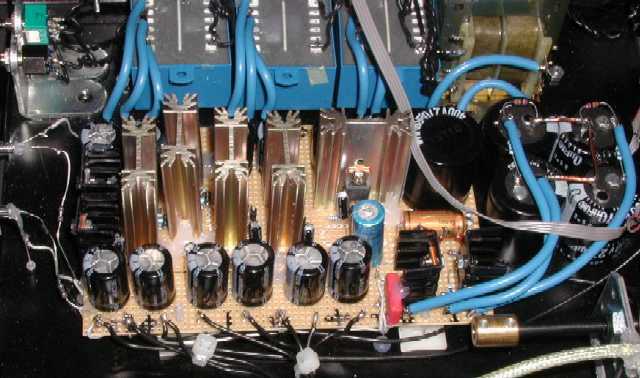 The power supply for the tube stage is build around a stable source follower with MOS FETS, giving high line regulation and a low output impedance, needed for driving the RC filter sections between the MOSFET and the MU stage. In total 3 sections of 100 Ohm and 270uF are used. Why not 300 Ohm and 840uF ??? Actually very simple, 3 cascaded 6dB filters will produce a 18dB/octave filter for frequencies above the Fo in stead of a 6dB filter which might start "earlier" but is not as steep for high (noise) frequencies. The cut off frequency of each section is 6Hz, so in the most sensible audio band above 100Hz the regulating part is almost 100dB away from the Tube stage. See also my design philosophy section on why I believe this is the right approach.